Discover Holland's best kept secret: its food! Our cuisine is not well known but nonetheless exciting, flavorful and full of history. 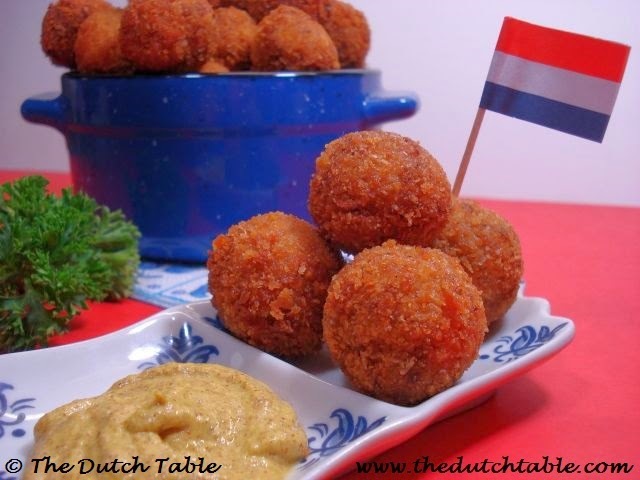 The Dutch Table is your online resource for traditional Dutch food recipes, and is growing steadily. Become a follower and like the page on Facebook, Instagram, Pinterest and Twitter for additional updates, discussions or exciting food news! In Holland, a night out on the town, or a social event with coworkers, usually starts out at a local café, with a beer and something called a "bittergarnituur". The word translates as the slightly confusing "garnish for bitters", where bitters in this case refers to alcoholic beverages. The Dutch were one of the first to dedicate themselves to perfecting the distillation process, presenting the world with spirits such as Dutch gin (jenever) and a large variety of liqueurs and bitters, these last ones presumably with medicinal properties. Nowadays, one of the most famous drinks is Ketel One, a Dutch vodka that is especially popular in the United States. Alcohol is traditionally consumed with something savory on the side, and thus the bittergarnituur was invented. This colorful platter will usually contain bite-size cubes of Gouda cheese, miniature eggrolls and meatballs, perhaps some slices of salami or chorizo and of course, how can it not, the marvelous bitterballen. Bitterballen are one of Holland's favorite snacks. In the early and mid-1900s, they were the housewife's perfect way to transform yesterday's meat leftovers into today's appetizer. Served shaped as a log (kroket) or in bite-size rounds, bitterballen were often served as an aperitif, or tapa, before lunch or dinner. Nowadays, bitterballen are predominantly served outside the home, either as part of the bittergarnituur or as a snack on the side with a portion of French fries, but are no longer part of the housewife's culinary repertoire. Which is rather unfortunate, because bitterballen are easy to make and freeze beautifully for later use! This deep-fried, crispy, bite-size ball of meaty gravy is to be eaten with a good, savory mustard. Take the bitterbal between thumb and index finger, dip one side into the mustard and pop the whole thing in your mouth. No double-dipping! Bitterballen are also, presumably, best eaten while piping hot! Bitterballen are traditionally made with beef, but can also be made with chicken, veal or even with mushrooms, for those that prefer a vegetarian option. Make a roux with the butter and the flour (slowly melt the butter in a skillet or pan. When melted, add the flour little by little and stir into a thick paste). Slowly stir in the stock, making sure the roux absorbs the liquid and there are no lumps. Simmer for a couple of minutes on a low heat while you stir in the onion, parsley and the shredded, chopped beef. Bring it back up to heat while stirring.Taste, add pepper and salt and a pinch of nutmeg. Taste again and adjust if necessary. Pour the meat gravy into a shallow container, cover and refrigerate for several hours, or until the gravy has solidified. The mixture should be so thick that you can cut squares out of it. Take a heaping tablespoon of the cold, thick gravy and quickly roll it into a small ball. I weigh mine out at approx. 20 grams each, or .7 ounces. They can be a bit bigger, up to 23 grams, as long as they're all about the same. Roll lightly through the flour, and put them back in the fridge while you prepare the next round of covering. Beat the eggs well. If you use panko, you may want to pulse them once or twice in the kitchen processor, or just squeeze it between your fingers, as some pieces tend to be fairly large. Take the floured balls out of the fridge and rub them between your palms once more, if they need rounding a bit more, then carefully dip them in the egg on the tines of a fork. Make sure that the egg covers the whole surface of the bitterbal. (If it doesn't, the filling will spill out into the fryer and you will be left with a hollow shell, and a messy fryer!). Tap the fork on the rim of the plate to remove any extra egg, and then roll the ball through the bread crumbs. Set each ball aside on a plate. *Optional: after breading them once, I personally prefer to pop them in the freezer for about half an hour, and then I egg and breadcrumb them again. This creates a slightly larger bitterbal, but with a thicker crust. If your kitchen is exceptionally warm, you could refrigerate them in batches of ten. But when all are done, refrigerate or freeze the snacks while the oil in your fryer heats up to 375F. If you are not planning on serving all 50 bitterballen, you can freeze them individually and then store them in a closed container in the freezer for later. There is no need to thaw them before frying. Fry five to six balls at a time, until golden brown. 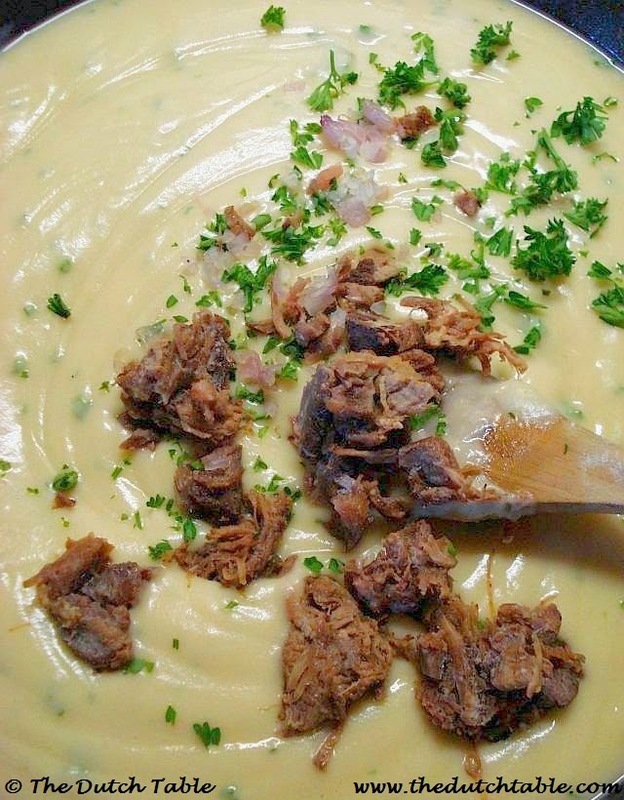 Serve on a plate with a nice grainy or spicy mustard. Next thing I'm going hunting for is a slagroom taart recipe. I find the average birthday cakes here so heavy and overly sweet with all the icing (cheese cake excluded which is wonderful). We were introduced to these treats in Aruba and can't wait to try to make this recipe now that we are home and can't find them! Thanks. Thank you for the comment, and welcome to the blog! I'm glad you found us, and hope you enjoy the bitterballen, they never last long around here! I fully agree with you on slagroom versus birthday cake. Keep an eye on this blog's sister site: http://mydutchbakingblog.blogspot.com for a recipe in the next couple of weeks! Thank you so much for this recipe! My husband has missed but two things since we came to the US... bitterballen/kroketten, and frikandellen. There's no way I can probably really replicate frozen frikandellen like in NL, but these bitterballen have really hit the spot! 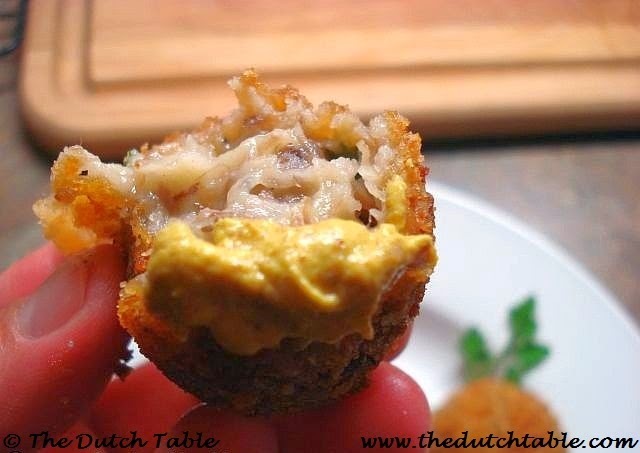 We quadrupled the recipe, and took a quarter and made sate kroketten as well. Delicious! I have one of those really old cookbooks that belonged to my husband's mother, but I haven't been able to get any of the things I've tried to work. This was perfect! Thanks for making these so easy to do, and "Americanized"! Now on to try krentebollen! Gorgeous !! I was looking for this for many years. Now I have it. Thank you very much !!! Welcome to the site, Rhonda! Wow, three dozen kroketten is a lot of work, but how fun! Excellent suggestion on the double breading, thank you! I had an old recipe for bitterballen, one of my favorite foods, and lost it but this looks very familiar. But instead of breadcrumbs I use the crumbs from the Dutch round crisp bread...not sure of the Dutch spelling but it sounds like biscuit but with the harg "G" after the "s". I think that is a much more authentic taste to what I remember my mother making for me on my birthday every year...kroketten. You are thinking of "beschuit" (buh-sG-out). There's a recipe on the website for it in case you cannot find any in the store. Panko is similar in flavor and texture, but breadcrumbs work just as well! I Love your website. Whenever i am in Florida i am using your website and also when i am back in Holland. I did send your website to all my friends. Will also mention it on my Facebook page. I am making the Bitterballen tonight with chicken for my American friends. Rob, thanks for the encouragement, it is appreciated! Hope you had a great evening. Rob, that tends to happen a lot, there are never enough bitterballen :-) Glad you and your guests enjoyed them! Excellent blog with recipes you have here Nicole! I love cooking and even grow my own 'Dutch' vegetables in the garden to suit my Dutch taste. What I can't buy in the shops, I make myself or grow it. 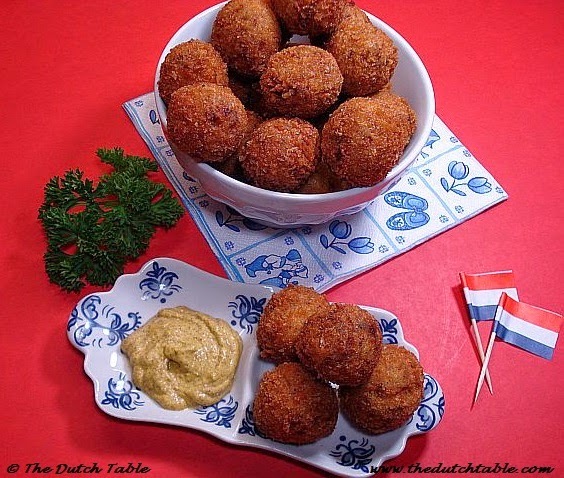 Although I make my kroketten slightly different -Mothers recipe- it's a joy to go throug the blog and find so many good and -lots- original recipes. You set yourself a task with so many different recipes. In every corner of Holland they have their own treats and different recipes. Meals or treats from the North could even not be known in the South as they have their own. I made my own recipe book with all things I learned from aunties, mother, grandmother, etc.. and of course my own alterations. It was a pleasure to find this (blog) gem and I will surely return! oh wat heerlijk deze site! ik woon zelf in het buitenland en zie dan maar is de nederlandse producten te krijgen of zelf te maken ! dank je wel nicole!! I visited Amsterdam last week for the first time and loved it. I had bitterballen with my meal one evening and wanted to make them. Your recipe seemed to be the most authentic so thank you very much! I will definitely keep making them and other recipes of yours! my mother used curry powder with almost everything which involved meat. she had a shaker of premixed seasonings (salt, pepper and curry) ready to use on the shelf and this was what she seasoned the bitterballen with. it went into the roux so that instead of a creamy colour, it was slightly yellow. it was delicious...today i use curry a lot myself as well...especially on pork and chicken. It's very, VERY similar to American white gravy. It's simply an easier way to explain to foreigners what this is like. Let's face it, there are no words to describe the joy that is a bitterbal! Honestly.. I love sausage gravy (white gravy with tons of pepper and crumbled breakfast sausage). I could make a heavenly bitterball and conquer the US. Southern spicy/peppery white breakfast sausage gravy!! I think you might take over the world with that. I'm surely going to try it! Jaklien, you are right you just can't explain bitterballen. And I love watching someone eat it for the first time and pop that whole baby in their mouth. HOT!!! Rob, that's so funny and true! Dip the whole thing in mustard, pop it in your mouth and then fan your open mouth with your hand while chewing and laughing at the same time. Not very charming table manners, but there is no other way - they have to be eaten hot-hot-hot! Sietske, I look forward to that bitterbal! I have done that so many times and also managed to burn my mouth!! I just moved to the states after living in limburg for the past 13 years. I've only been back two months but I already zuurvlees and bitterballen. I can't wait to try these out this week. Maybe even serve Bitterballen for the Super Bowl Party! I did notice that you do not have a recipe for stompot. Welcome home! You will find stompot under Hutspot, if you mean the carrot and potato one. Otherwise, look under Boerenkool, Hete Bliksem of Foeksandijvie. And if you still can't find your favorite stamppot, let me know and I'll gladly make it and post it. And bitterballen for the Super Bowl party sounds like a winner! Have fun! This turned out great but I doubled the syrup And I do not have stroop so I used dark corn syrup. The one I use in my BBQ sauce. Just like in Maastricht. Thank you for this web site I have all the recipes that were near and dear to me but this has so much more. I found the different types of stompot Thanks again. Stephanie, thank you for your kind words! It's been more than 50 years that I had Bitterballen. I'm so glad I found your recipe. get the oven on ! You're finally making my palate make sense. I have Dutch ancestry, but never knew what that meant. As I read the recipes on this blog, I see things that I have tried or gotten just to a certain point in your directions, but didn't know what to do next. (I want to try SO many recipes on this site!) And I've never had Dutch food to my knowledge. (I know much more about Middle Eastern, Asian, and Hispanic foods than European in America, surprisingly.) Thank you SO much for helping me start to reclaim my cultural roots. Looking for a good recepie for Loempia's, anybody out there have one, I'd be so grateful! Just found this site today and getting hungry just looking at it. What fun it will be to make all these familiar dishes! Thank you! Hi! I made these once (using your recipe) while living in NL and they were amazing. However, now we are back in the US I have tried twice to make them but the gravy doesn't congeal enough to be rolled. It just sticks to my hands, and I didn't have that problem before, even had the kids help me roll them. Any ideas what I am doing wrong? Ik heb geen idee! Maybe just semantics but in the Netherlands only full-cream butter may be called butter. I would like to try these but will probably wait until I actually have leftovers. Good motivation to make use of all that's in the fridge and cut down on waste. Wow this looks so good, delicious! Thank you for sharing this recipe. Hi, can you tell me if I decide to freeze them for later use should it be done before or after I have crumbed them ? aah, been looking for a legit bitterballen recipe for a while now. i grew up eating this (and other dutch food/snacks) and i've missed it since i moved to the US. how do you freeze them? before dipping in flour/eggs/breadcrumb? after frying (although i should think not)? or dipped and then freeze? You can roll, flour, egg and breadcrumb the bitterballen before freezing them. Remove them from the freezer about half an hour before frying and you're good to go! Have you ever tried to bake them in the oven instead of putting them in the deep fryer? I am a Dutch woman and bitterballs are my favarits. Also the beafkrokets. But one thing in your information isn't right. We do not eat a bitterball in one bite. That is impossible because the insite ragout has to be burning hot. Mostly people will have little bites of the crunchy outsite first. Than the steam can come out quicker. You can dip them as many thime in the mosterd as you want. The bitterbals are also a verry famous snack for in your fridge at home. Also the kroket. All the shops sell them. And the quality is various. I know the best are the Van Dobben or Kwekkeboom. Do not try the Morakrokets. Brrrr..
Kroketten/krokets we also eat alot with a slice off bread. So a sanwitch with butter, kroket and some mosterd. Mmmm. As lunch you can order this in many restaurants and lunchbars. Do try it sometime when you are in Holland again. Hi Nicole, as the weather gets colder, I am missing real Dutch food. I am going to try these out this weekend. Can't wait. BTW do you know how to make Kaassouffles? I loved getting those out of the vending machines in Amsterdam as a child. These were incredible! I was in Amsterdam last week and have been remaking my favorites at home. So glad I can continue to enjoy Bitterballen even though I am back in the states. Thanks! First tried these little beauties when in Nl with friends, going to try to recreate the magic tonight! Yummy....tasty.... i really like this recipe but i just wonder how long i could keep it in fridge? I want to keep some for my little sisters when she comes back after her trip. Jio, it's best if you freeze the bitterballen until your sister returns from her trip. They can go straight to the fryer from the freezer. Nicole, I'm so happy! Are you Dutch? We moved to South Africa and I don't really need appelstroop or bitterballen, but it will be SO MUCH fun to make them when I feel a bit home sick. I never heard of molasses before, but fortunately they sell it over here :-) Thanks a lot. Seriously,my mother will be happy after reading this.Keep sharing more. Lolo, it's best if you freeze them right after you roll them in bread crumbs. Chill them for about an hour in the fridge, then transfer them to the freezer. I leave them on a plate or a baking sheet overnight so that they can freeze individually, and then I add them to a container. They may stick and freeze together if you don't, which could affect the breading. When you get ready to fry, just pull them out of the freezer about fifteen minutes before and let them sit on the counter while you are waiting for your fryer to heat up - they are small enough that the inside will reach the right temperature. If you want to fry them first, then freeze them, you can do that too, but I would recommend heating them back up in the oven instead of the fryer. The first method is the least cumbersome and makes for the freshest bitterballen. Either way, you may have to do some sampling while you fry *wink* Eet smakelijk!! My mother always made Bitterballen. Her recipe used Veal to make the stock and gelatine to help them set. We always had them with German Mustard. I have the hand written recipe still. My kids are always begging me to make them. They can be a little time consuming if made from scratch. Maybe this is a very stupid question, and a tad late, but what kind of beef do you use for this, and how do you properly prepare it? I was born and raised in the Netherlands, lived there till I was 21, and have been in the USA for the better part of 6 years. I'm really starting to miss the Dutch snacks, and bitterballen is absolutely one of those! I want to make sure I make it just absolutely right, and this recipe looks delicious, and the end result in the pictures look spot-on! No stupid question at all :-) the same thing happened to me! I left the Netherlands as an adult, but after a while I started missing my familiar foods - and that's how this website got started. I am glad you found us! As for your question, you can use any beef that's left over from a roast. If you start from scratch, I would recommend a tougher cut, like chuck roast, and simmer it with a beef bouillon cube, a bay leaf and half an onion until the meat is tender and can be shredded. You could use the stock to thicken the roux. It's not a difficult recipe, but takes some recognizing when the roux is thick enough to roll. Have fun and let me know if you have any questions! It's quicker to contact me through our Facebook page, if you have that, or email me directly at nicole at thedutchtable dot com, and I will be happy to walk you through the recipe! Thank you so much for the quick reply! I'm absolutely going to try this at some point, being home-sick for food is the worst! I haven't had the chance to travel back home yet, but I've had my family over this way multiple times now. I get "care packages" sent as well, with stroopwafels, paprika chips, kwark taart mix, licorice, etc. All the good stuff! But meats are illegal to import, and the craving for a friday night bitterbal snack with a nice, hearty mustard is hard to satisfy! I welcome your comments! Please be so considerate as to include a name, as anonymous comments will be deleted. Comments will appear as soon as they are monitored (usually within 24 hours). If you have a direct question, please consider emailing me at nicole at thedutchtable dot com for a faster response, or post on our Facebook page. Notification: all the pictures, texts and recipes on The Dutch Table are taken, written and developed by me, unless specified differently. Please be so kind as to ask first, credit me and link back to The Dutch Table when you borrow material from this site. Thank you! Click for the local food guide to Amsterdam! Copyright The Dutch Table LLC. Simple theme. Powered by Blogger.